Kasey Jueds. Keeper. University of Pittsburgh Press, 2013. 78 pgs. $15.95. 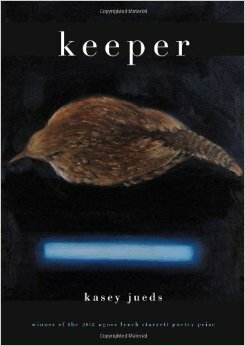 Winner of the Agnes Lynch Starrett Poetry Prize, Kasey Jueds’ Keeper is filled with poems that have stuck with me, and only now am I fully understanding why. Most of the poems are image-driven lyrics, but the speaker’s presence is often muted, even when she enters the poem as “I” or, less often, “you.” The poems are thoughtful, as if the material continues to turn in the speaker’s mind, as if meaning emerges like light tilting against a holograph. Although each image blends logically into the next, we often end up quite far from where we began. This is how poetry ought to work, through reliance on the concrete, the work of comprehension transpiring in the reader’s mind, the poet providing all that is necessary and nothing that is not necessary for comprehension. The syntactic repetition in the first two stanzas is inviting, even comforting. “First dark, then” leads to “First sleep, then”—though the second occurrence becomes eventually startling. We can recall a bat’s distinct darkness against night’s darkness, and against the darkness of sleep. And we can recall the moment between noticing and naming. Here is where Jueds’ skill with lineation is most evident: For a moment, / you can’t name it. And for a moment // you’re not afraid. Remember…” The lines break at “moment,” extending that moment for the reader. Line seven serves as the fulcrum upon which the poem balances, a single-line stanza that reads as a reminder to be not afraid. But “Remember,” of course, carries the poem over its turn, the speaker describing Blake’s angels so that we seem to remember them even if we’ve never seen them. The angels balance themselves somehow because they hover above empty space—or space that is filled with meaning rather than with material structures. A thing becomes itself through time apparently, for during the immediately preceding moment, “rain / isn’t rain.” Rain is what will be, and space is filled with understanding of what will be. Jueds describes rain plausibly as “something silent and clean,” and if we’ve been reading attentively and receptively, we’re now willing to consider the bats as angels balanced on the tips of their wings, as things “silent and clean.” We might resist such an suggestion almost reflexively, until we remember the poem’s central caution: “you’re not afraid. Remember.” I appreciate the suggestiveness of this poem, not so much in its identification of bats with angels, for that identification relies on the clear logic of analogy, but with the next leap, the association of these flying fearsome creatures with the cleansing precision of rain. for our hands to begin. The poem begins factually, and the fact is interesting in itself, but the poem then shifts to the undeniably subjective: “I want to call it kindness.” The poem moves through several figurative turns, including some startling visual images. The “leafless tree, covered in oranges” startles us with brilliant color, and then the head of St. Catherine startles us differently—after these references to nature, we aren’t expecting the macabre. But Jueds doesn’t include this detail as a gratuitous shock; it, too, illustrates the “kindness” the universe extends to human beings. We are limited creatures, intellectually and emotionally as well as physically. Yet the kindness the universe extends also implies fulfillment: water vapor contains the cloud even before the air is cooled; the head suggests the body even when severed from it; and finally, the ball of yarn contains the blanket the hands will knit. Most crucial to this final image, of course, is the requirement of human participation. Having read this book, I find myself thinking differently. These are poems of quiet revelation. They show me a mind thinking, in images and through metaphor, turning an idea over and then over again. Reading Jueds’ work feels like walking around a large scuplture, noticing how it seems to move of its own accord, responding to our angle of vision. I won’t say I’m looking forward to her next book, not yet, because Keeper provides me with enough to mull over until that next book arrives. Regular readers of this blog will note that Kacey Jueds has contributed a couple of guest reviews. In the interest of full disclosure, I want to state that my relationship with her is limited to correspondence regarding those reviews. This entry was posted in A Review A Week on November 24, 2014 by Lynn Domina.